I am thrilled that the first topic for the new digs of Girl Talk Thursday is Your Top Five. It's the perfect subject for the opening of our Ladybusiness. But first, a very special thanks to Maria for starting Girl Talk Thursday over in her awesome corner of the blogsphere, Mommy Melee, and also for including me, Tatiana, Diane and Cat in hosting the new site. "...Comment. Communicate. Karma." Maria babe, you've got some shiny happy karma. Love you! So who's in your Top Five? Dark hair. Blue eyes. Strong jaw. There is no one scene that strikes me as the first time I remember noticing him. He just is there, for the eye candy. Does anyone else remember the movie Empire of the Sun? I was 10 when it was released and I think I was 11 when I first saw it. I remember this because my BFF (at the time of course, what is forever to an 11 year old?) and I watched it (on VHS, gasp!) about 100 times the summer between 5th and 6th grade. We watched it to watch him. He was her teen crush and since I spent so much time with her it sort of rubbed off on me. Her room had dozens of posters of him hung up while mine had dozens of posters of Kirk Cameron. (dying inside for admitting that one) Look who grew up to still be a hotty though! I likey his smiley. I first noticed (wink) Taye Diggs when he was Detective Brett Hopper in a show that sadly only was on one season, Day Break. He's got a wicked bright smile contrasted by his smooth dark complexion and he's got really nice eyes. He's hot but I think he's the most approachable of my Top 5. Like if I saw him on Hollywood Blvd I'd probably go up to him and say "Hey, I watch Private Practice and all but I wish they didn't cancel Day Break because that show was awesome." But there may or may not be a line of drool descending from the corner of my mouth when I talk to him. Sadly, I am under the spell of McDreamy. It's the voice in the quiet scenes of the show. It's the blue, piercing eyes and the dark hair. It's the smile. Taye Diggs's smile OMG. Lights up my whole damn house. I loved Patrick Dempsey in Enchanted. And Amy Adams, too, for that matter. Your list is awesome! I'd totally go for Christian Bale too. yummmmmm. ahhh.... christian bale was THIS CLOSE to making my list.... THIS CLOSE!!!! Oh Christian Bale....yum. He's backup #5 for me...just in case David Beckham is unavailable. Only...let's get some meat on his bones. I hate it when he gets super skinny. I am LOVING this list-hopping I'm doing. Yes YES Matthew McConaughey! GAWD HE IS HAWT! Matthew McConaughey and Patrick Dempsey both came SO close. Maybe next time we revisit this question we'll have all seen the wisdom in a Slightly Longer Than 5 List? Heh. Great list! Great fun, in general. Thanks for all the work to get the fun rolling, too! Christian Bale...where were you when I was putting my list together?? 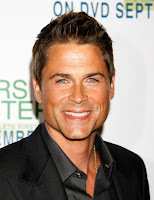 I adored Rob Lowe in The Stand. And Patrick Dempsey...OMG I've loved him since I seen Loverboy back when I was 13 years old. And yeah, McDreamy and Amy Adams in Enchanted is such a perfect mix. For me, Coll, Christian Bale will always be the star of "Newsies." And I will always be 15. Matthew would have been #6 on my list.. you know, if it was a Top Six. In fact, I'd take him and Kate Hudson a la How To Lose a Guy In Ten Days and lock them both in my bedroom with me. Rawr. The week that was... well... bad.